With sea on three sides western Ardnamurchan is fringed with stunning beaches, secluded coves and quiet shores to discover. The north west coast of Ardnamurchan is strung with an beautiful stretch of sandy beaches, starting with the famous white sands and rippling dunes of Sanna bay. Pack a pack lunch and follow the signs for ‘Sanna’ for a day of walking, swimming and glorious views. Visit Portuairk village, a charming, tiny village with a lovely, sandy beach. There is a small space for parking on the right hand side at the bottom of the hill in. Follow coastal trails which meander along the north coast to discover hidden coves all to yourself. Cruise west to experience the beauty and mystery of the Treshnish Isles with Staffa Tours, while keeping an eye out for dolphins, minke whales and basking sharks on your way. Sail straight into the gloom of the famous Fingal’s cave, marvel at the impressive, towering, stone walls of Staffa Isle, and get ready to see puffins, guillemots, and gannets galore – no zoom lense required! 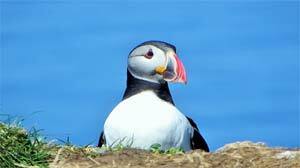 (Puffin is season April – August). 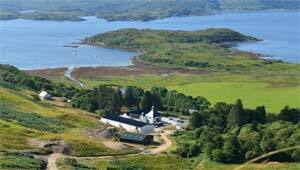 Ardnamurchan Charters have been exploring the beauty and seclusion of Loch Sunart since 1985. They know every hidden cove and secluded island and have an extensive knowledge of the life which abounds there. Due to the unique and rich diversity of plant and animal life that abounds there the loch is a marine protected area of great importance for wildlife enthusiasts. 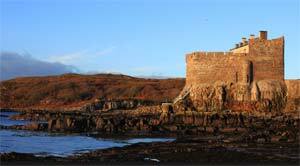 Ardnamurchan Charters offer a range of tours. You can book and find out more on their website Ardnamurchan Charters. 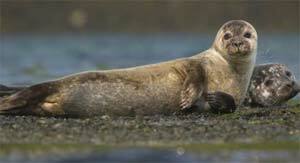 For some wildlife watching on land take a trip with Wild Highland Tours. Their experienced guides will take you by jeep and on foot to some hidden spots, sharing the history of the land and helping you encounter some rare, Scottish wildlife, including golden eagles, pine martens and wildcats, all to the majestic backdrop of western Ardnamurchan. 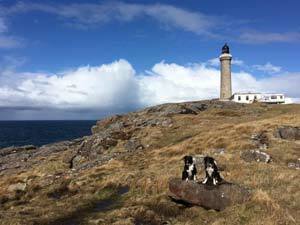 A must-visit is Ardnamurchan Lighthouse, which crowns the most westerly point. 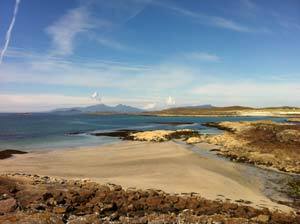 On a sunny day take a tour up the lighthouse and enjoy 360 degree uninterrupted views as far as the Outer Hebrides. Ramble around the headland, looking out for whales, dolphins and basking sharks, frequent visitors to the lighthouse. On a stormy day marvel at the majesty of the crashing waves and rolling seas and have a look around the exhibition inside the old light-keepers house. There is a cafe serving coffee, cake and snacks and a gift shop. 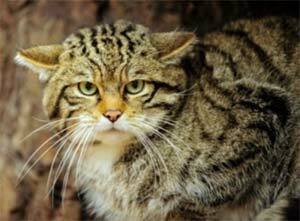 A twenty minute drive from Kilchoan the Natural History Centre offers fun for all the family. The living building is an amazing turf and wood construction filled with interactive games and nature displays. The building itself is home to some local animals that have fortuitously decided to move in, including long eared bats, field voles, and swallows, there have also been families of pine martens intermittently over the years. 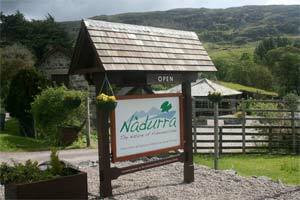 There is also a well-stocked gift shop and a great tearoom serving lunches, coffees and home baking. Cinema evenings also run through the summer. Newly opened on the beautiful shores of Loch Sunart in 2014, Ardnamurchan Distillery is one of the greenest in Scotland and is definitely a contender for the most scenic too! Whether you’re a whisky lover or just want to see the whisky making process in action pop in to take a tour and treat your taste buds to a sample. Tours are on the hour daily except Saturdays. Sundays are by appointment only. On the north coast at Ockle, there has been a recently discovered Viking boat burial site, the first of its kind to be found on the British mainland. It has been described as ‘one of the most important Norse graves ever excavated in Britain’ and included remains of a Viking chieftain, lying in his longboat surrounded by his sword, knife, spear and drinking horn, with his cloak held with a pin from Ireland and his shield lying across his chest. The Kilchoan Pub has a cosy bar with open fire, dining room, honest pub grub, a good selection of whiskies, and a beer garden. Feast on a fourteen course meal in the banqueting hall of Mingarry Castle, a recently restored 13th century castle proudly perched on the water’s edge. A unique and memorable experience for which booking is essential. Kilchoan crafts and gallery shares it’s home with the Steading Holidays offices. It is a snug little gallery filled with the labours of local artists and craftsfolk and serves teas, coffees, home baking and snacks. Next to the gallery is the workshop of leather-worker John Chapple who has been making belts for fifty years and will gladly fit you for a hand-stitched, custom belt. Although an amicable, gregarious man, I would recommend refraining from using the phrases ‘wifi password’ and ‘belt repairs’ in his presence. For a rainy day head to the Kilchoan Community Centre, where you can play badminton, basketball, table tennis or table football, with a football pitch outside. There’s also a small tearoom. We’re very proud of our family, wood, turf and willow play park, which you’ll find outside as well, which has lots activities and a bbq area.